2013 Mercedes E63 AMG review | What Car? The E63 AMG, Mercedes' fire-breathing performance saloon, has been updated along with the rest of the E-Class range. The changes also just happen to make this the fastest E-Class ever. While the previous E63 was available with an optional performance package that boosted the power output of the car's 5.5-litre twin-turbocharged V8 from 517bhp to 550bhp, the new car comes with 550bhp as standard. The existence of a power upgrade will remain, though. The E63 will be available as an 'AMG S' version, which boosts power to 577bhp. Mercedes hasn't decided exactly how much this version will cost, but has indicated that the upgrade will be 'less than 10,000'. 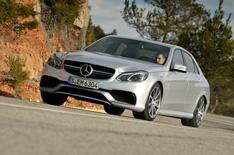 What's the 2013 Mercedes E63 AMG like to drive? We drove the 'basic' E63 AMG, and we reckon it's plenty fast enough. The 550bhp is combined with an epic 531lb ft of torque that's delivered from just 1750rpm. The result is astonishing. This big, heavy saloon can power from 0-62mph in just 4.2 seconds, and it feels good for every single tenth of it. In fact, whatever the driving situation, any sort of meaningful throttle input results in an incredible surge of acceleration. The car's pace is aided in no small part by the standard seven-speed twin-clutch transmission, which swaps cogs quickly and smoothly. That's with the gearbox in its 'Controlled Efficiency' mode, too. Select one of the two sportier automatic settings (there's also a fully manual setting) and the 'box progressively increases the speed and intensity of the shifts. The sportier settings also allow the engine to rev harder before it changes up, and the throttle starts to blip automatically on downshifts. The car sounds just as dramatic as it feels. There's a deep V8 burble that turns into a bassy howl as you pile on the revs. However, things settle down to barely a whisper at cruising speeds. In fact, cruising is exactly what the E63 does best. Wind- and road noise are very well contained, and with the adaptive suspension in its Comfort setting, the ride stays impressively smooth and civilised. That said, our drive took place on super-smooth Spanish roads, and things might not be so rosy on the UK's battered road network; after all, the outgoing AMG was a shade lumpy on these shores. Switch the suspension to one of its two sportier modes, and it becomes firmer for better body control. You still feel more lean in bends than you do in rival performance saloons, but the E63 changes direction cleanly and accurately, particularly for such a big car. Grip is immense, and the steering is weighty and responsive. What's the 2013 Mercedes E63 AMG like inside? Surprisingly sober. You'd expect an exotic version like this to be festooned with bespoke badging and carbonfibre inserts, but the AMG's interior gives very few clues as to what's beneath the bonnet. You could be sitting in pretty much any other E-Class. Like all revised E-Class models, there's a nice stitched-leather covering on the dashboard. However, many of the other interior panels are disappointingly dour. The dashboard layout is unchanged, which means it's rather illogical and button-heavy. Those old Mercedes quirks remain, too, such as having the indicators and wipers controlled by a single stalk. That said, you get excellent all-round visibility, and the fully electric seats make it easy to find your favoured driving position. The cabin dimensions haven't changed, either, so there's still generous space for four tall adults, along with a large boot. If you can afford to buy the E63 AMG, you probably won't care that it will only return around 28.3mpg. You probably won't care that it costs a few hundred pounds more than a BMW M5, and a few thousand more than a Jaguar XFR, either. We can't say which of these three cars is better until we've driven them back-to-back in the UK. However, we can say the E63 delivers an intoxicating mix of devastating performance, impressive refinement and high-quality comfort, while giving you all the space and practicality of a regular executive saloon. If that's what you're looking for, and you don't mind paying handsomely for it, then the E63 AMG could be just for you.